Welsh donors have been praised for playing a key role in saving the hut built by Captain Scott when he arrived in Antarctica 100 years ago this week. The United Kingdom Antarctic Heritage Trust (UKAHT) paid tribute to Wales' "generosity and enduring faith in the Scott legacy". Captain Robert Falcon Scott departed on his mission to become the first man to reach the South Pole, from Cardiff in June 1910, forging a century-old place in the Welsh psyche. In January 1912, he and four companions achieved their objective of reaching the South Pole, but heart-breakingly, some five weeks after the Norwegian team led by Roald Amundsen. Tragically, the return journey towards their ship, the Terra Nova, cost all five men their lives. 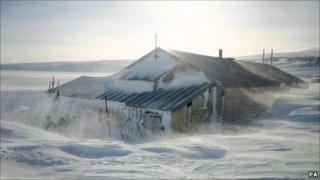 It has taken eight years to raise the £3.5m required to ensure the long-term future of Scott's hut. Some £2.25m was secured from government grants, and match-funding from charitable group The February Foundation, with the remainder coming from individual donors. According to Charles Stuart Smith of the UKAHT, based in Usk, Monmouthshire, a disproportionate amount of that private funding came from people in Wales. "The response from all over Britain was incredible, especially considering how terrible the economy has been over the last few years," said Mr Stuart Smith. "But people in Wales seem to particularly identify with the cause, whether that's because Scott set out from Cardiff, or because the UKAHT is based in Monmouthshire, I honestly couldn't tell you. "What I do know is that their generosity has been phenomenal, they truly do have an enduring faith with the Scott legacy." In 1910 Scott relied heavily on school children to fund his expedition, with schools sponsoring a sledge dog or set of skis, in return for the honour of having their name transported to the very bottom of the world. A century later and Mr Stuart Smith says youngsters have once again been among the campaign's most generous and enthusiastic supporters, though ecology rather than exploration now seems to be their main motivation. "I think now as then, children can identify with Scott's sense of adventure," he said. "He came on the cusp of the Victorian age of pioneers, and the 20th Century age of technology. The missions to the Antarctic were the space race of their day. I think that sense of being on the very cutting edge of discovery, in the face of tremendous hardship, is just as exciting today." Mr Stuart Smith said part of the reason why the work was so badly needed was because of the changing climate in the Antarctic, and the fact that melting ice is allowing water into the hut. "We're aiming not only to restore Scott's hut, but also to highlight the effect of climate change on the environment for which Scott gave his life," he added. "That, more than anything else, is what resonates with young people today." The restoration work will be carried out by specialist teams from New Zealand, and could now be completed in time to mark the 100th anniversary of Scott's death in March of next year. As well as saving the building itself, the conservation will protect around 8,000 artefacts left during the mission, ranging from notebooks and flints to sledges and insulated clothing.